68 - Avanzate risoluti. Badate al cuore, perché il vaso che contiene il mondo intero si deve portare con ogni cautela. Basta procedere senza vacillare. Se trattenete l’irritazione, create un nuovo fodero per lo spirito. Anche i cavalli galoppano meglio se non sono sudati. Meditation's place. Bosco di lecci sacro dal tempo di Giove. Wesak's Valley. The flat rock where the Christ and the Buddha appeared every year until 1980, it is on the left. 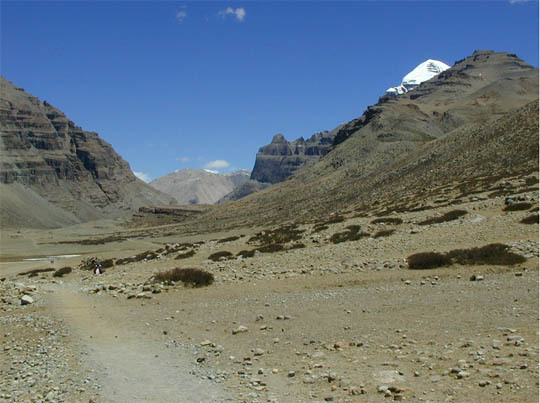 On the right there is the white dome of the Kailash. As discussed in the World Goodwill newsletter “What is Life?”, esoteric philosophy regards Life as “a constant flow of electrical energy, while forms are temporary expressions through which life manifests at the dense physical level”. The whole of manifestation is therefore alive – the atom itself having a rudimentary consciousness. With this in mind we can take a fresh look at one of the big worries of our time – changes in global climate and weather patterns – viewing them from the angle of intelligent, electrical life. Scientists are still debating the cause of the thousands of electrical discharges taking place all over the planet at any one time via thunderstorms and lightning. They are generally thought to be due to atmospheric perturbations and perhaps the impact of charged particles from the sun (the solar wind). A further conundrum has been the recent discovery of electrical discharges taking place high above thunderstorms called Transient Luminous Events. These dazzling displays include colossal towers of red and blue light known as Sprites, rapidly expanding rings of luminosity referred to as Elves, and rising up out of the clouds, fingers of bright light that have been christened Gnomes. These phenomena are difficult to explain mechanically i.e., as a result of wind driven charge separation taking place in the clouds far below. But in contrast to these orthodox theories of atmospheric science, pioneering thinkers in plasma cosmology regard the earth as part of an electric circuit in which the sun and the planets act as opposite electrical poles. The constant restoration of equilibrium is known as homoeostasis – a common property of all living organisms as they regulate their internal environment to maintain a stable condition; and the earth itself is a living organism, its global weather patterns and climate guided by celestial intelligences in accordance with planetary and human karma. This, of course, is a far cry from the search for mechanical explanations by atmospheric scientists, but the primary causes of climate and weather must be sought for beyond the world of outer effects in the subjective realm of consciousness. This is an intriguing thought in view of the current focus on climate change and the world crisis that has grown out of it. While global warming through carbon emissions may well be adding to this, there are many other factors at play from the esoteric viewpoint. To focus on one of them, it may be that our turbulent desire nature and selfish thinking is adding to the unsettled climate of the planet. Even on physical levels, recent scientific investigations are indicating how this may be so. An example is the discovery of biogenic magnetite in human brain tissue by means of which the human central nervous system may interact with environmental magnetic fields. Current research is looking to see if magnetic material exists specifically in the pineal gland as it does in birds and animals, by means of which they interact with the earth's magnetic field for navigation. The pineal gland is situated in the centre of the brain in a tiny cave or resonant cavity. This may correspond to a resonant cavity that exists between the surface of our planet and its ionosphere – a spherical shell that is excited by lightning strikes from the two thousand or so thunderstorms that are taking place around the globe at any one time. It has been discovered that the electromagnetic resonances produced here are of a similar frequency to the alpha and theta states of the human brain and that other resonances also exist between various layers of the earth's electromagnetic ionosphere and the brain.6 The Ageless Wisdom teachings extend this interaction to the spiritual aura of the earth too, teaching that through meditation, resonances can be generated in the brain cavity in sympathy with the frequencies of the inner, subjective realms of the planet, and their potencies distributed in service to all living beings. The ionosphere is just a part of the vast magnetic medium through which intelligent electric life works, and the clue to this has been with us all the time in the scientific term we use to describe weather and climate – meteorology. The Ageless Wisdom teaches that a veil of magnetic, meteoric dust surrounds the earth and it is the periodic expansion and contraction of this meteoric veil that affects climatic change. While less meteoric dust corresponds to a cooling of the atmosphere and glacial epochs, an increase of meteoric dust corresponds to a heating up of the atmosphere and hot eras such as the carbonaceous period. Geological records indicate that climate change has taken place repeatedly. Scientific expeditions have dug core drills down into glaciers and examined the tiny bubbles of air trapped over thousands of years and have correlated high earth temperatures with increased amounts of carbon dioxide in the earth’s atmosphere. Carbon dioxide and carbonic acid are key indicators of periods of global warming and interestingly, they are also prominent components of meteoric dust. Science acknowledges the fact that “dust particles left by falling meteoroids can persist in the atmosphere for up to several months; and that particles might affect climate, both by scattering electromagnetic radiation and by catalyzing chemical reactions in the upper atmosphere. However, the extent of meteoric influence on climate isn’t yet recognised. When it is recognised that meteoric dust is an integral part of the electromagnetic veil that surrounds the earth, and that human consciousness can subtly affect this veil in some way, the collective responsibility we bear to the lower kingdoms of nature through the right use and direction of thought will also become apparent. Through the scientific use of meditation in accordance with the law “energy follows thought”, humanity will then enter into its birthright as steward of the planet and the all consuming purpose of human life will be devoted to fulfilling the divine injunction contained in the Great Invocation: “From the centre which we call the human race, Let the Plan of Love and Light work out.” The fact that humanity is an electromagnetic “centre” in the vehicle of divine expression and has a destined responsibility to let this Plan of love and light work out in all kingdoms of nature points towards a truly awe-inspiring vision of the future. The power of applied group thinking will one day purposefully direct specific potencies into the lower kingdoms of nature to lift and redeem. 1. The Electric Universe, p 49, W Thornhill & D Talbott. 2. The Mahatma Letters to A.P. Sinnett, p. 160. 3. The Cosmic Blueprint, p. 132. Paul Davies. 5. A Treatise on White Magic, p 226. Alice Bailey. 6. http://en.wikipedia.org/wiki/Schumann_resonances. Theta waves are roughly thought to lie in the range of 6-10Hz, alpha waves in 8-12Hz. The resonance frequency of the earth itself has been measured to be 8Hz, in agreement with estimates first made by the inventor and electrical engineer Nikola Tesla. Soul centered Astrology is an asset!